Place ice cubes in blender. Add 2 scoops vanilla flavor protein powder. Add milk (or use a canned alternative like Slim-Fast). Use blueberries or raspberries instead of strawberries; these have a mild goitrogenic property. Very Good. Makes 2 large servings if made in a blender. Protein count depends on type of Protein Mix you use. 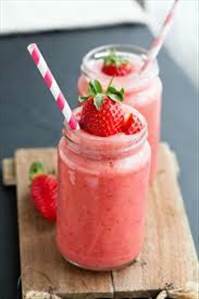 There are 439 calories in 1 serving of Strawberry Protein Smoothie. Calorie break-down: 15% fat, 19% carbs, 66% protein.